"We’ll have to admit to our children that, developmentally, our politicians just can’t play nice in their sandboxes." Let’s do a little thought experiment. Say little Timmy, age 10, gets a paper back from his teacher, and the teacher’s written comments make him very unhappy. Let’s say he wads up his paper, and with a dramatic and disgusted flourish, throws it into the trash in front of his teacher and peers. We’d all agree that little Timmy will find himself in the principal’s office pretty quickly. If the school is good at what they do, and his parents are thoughtful in the lessons they impart to their son, then Timmy will come to learn that while he is allowed to disagree, even with his teacher, he must be able to organize his reasons for disagreeing into a coherent argument. But what if you’re a U.S. senator, and you and your constituents disagree with the president of the United States? What if, instead of doing what you just encouraged little Timmy to do, you use your bully pulpit to wad up the president’s most recent document, and throw it in the trash in a dramatic video that you broadcast via social media? Can a U.S. senator be sent to the principal’s office? That’s why you get sent to the principal’s office when you’re 10 — to (hopefully) learn when to avoid doing things that would get you sent to the metaphorical principal’s office when you become a U.S. senator. Still, this is exactly what Senator Pat Roberts of Kansas did last week. Instead of saying something like, “I disagree with the president on Guantanamo for the following reasons,” Roberts tossed the Guantanamo plan in the trash. I grew up in Kansas, and still follow my home state’s politics. My children saw this video as I was reading the paper online. Try explaining the actions of a U.S. senator who is dramatically and disrespectfully throwing away a document from the president of the United States to your 10-year-old. This, in a nutshell, is what we’re dealing with this year. I think that as we look back on the current political rancor, we’ll come to see these surreal months as watershed moments: we’ll have to admit to our children that, developmentally, our politicians just can’t play nice in their sandboxes, even though we want our children to be able to play nice in theirs. Civility within politics does not negate the heated rhetoric of politics. Civility is the cornerstone of our system, and is a far cry from the nasty, exclusionary and downright frightening behavior that we’re witnessing. Believe me: Kids are picking up on the violent overtones to the current rancor. One child I know compared it to pro-wrestling. Another slightly older kid noted that his peers at school are refusing to talk to anyone who fails to be 100 percent like-minded. I heard a conversation today in which a father explained that he wasn’t going to back down within the current political climate because “a real man” and “a true father” shows his kids how to be strong, and how to stand up without compromise for what he believes in. A real parent, a strong parent, a principled parent realizes that you don’t and can’t get everything you want, and that you will, inevitably, have to compromise. You slow yourself down and teach your kids to slow themselves down. You cool down the rhetoric and the vitriol. You ponder and you construct a healthy debate. Why? Because healthy debates are healthy. Hatred, on the other hand, is like a dirty bomb. There’s nasty and unpredictable collateral. It might feel good to the inner baboon within us to trash one another; but it’ll catch up with us. Let’s protect our children from all that this new-found political barbarism engenders. 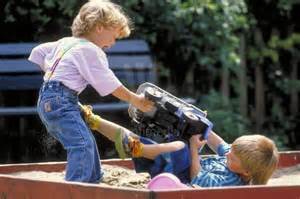 Let’s play nice in the sandbox. After all, it’s what we ask our children to do. It’s the least we can do, too.